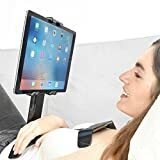 When you first set eyes on the TSTAND Handsfree iPad Stand, you’ll immediately think to yourself that it’s one of the most ridiculous things you’ve ever seen. Seriously, just look at that thing… a stand that holds your iPad on your belly. But the more you look at it, the more you realize that it could seriously come in handy. And the design is actually quite smart — flip the base around and the stand will prop up your iPad on a desk or table. Plus, it fits every iPad out there as well as pretty much any other tablet. Actually, I’m going to go order one right now because I kind of need this in my life. FITS ALL tablets / iPads IN LANDSCAPE (horizontal) MODE- iPad, Surface Pro, iPad Pro, Asus Google Nexus, Samsung galaxy, iPad mini or device! PATENTED H-shaped base allows for a custom viewing angle and easy transition 2 modes: bed mode and desktop mode. Fits many BUT NOT ALL protective cases, DOES NOT FIT iPad Pro, in otterbox case.